When it comes to eating out with kids, we always tend to play it safe for fear of the kids showing us up, refusing to eat their food, and ultimately creating a miserable experience for all of us. 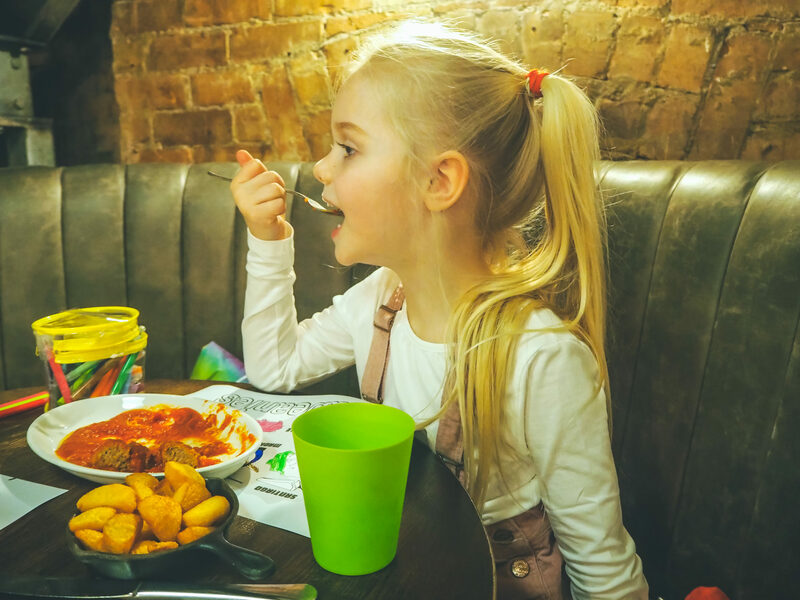 But during our stay in Nottingham last month, riding solo with the three of them, we were keen to experience new dishes, try new things, and hopefully broaden the children’s horizons with all that Nottingham had to offer. 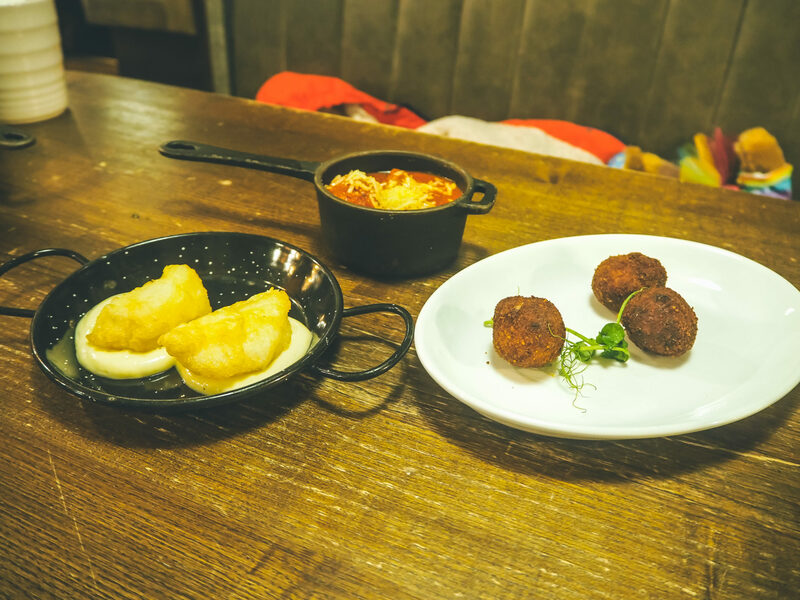 We ate at some amazing restaurants throughout the week, you can read our review of Belgo here, and Revolution De Cuba here, and I wanted to share three restaurants that are well worth a visit when dining with kids. 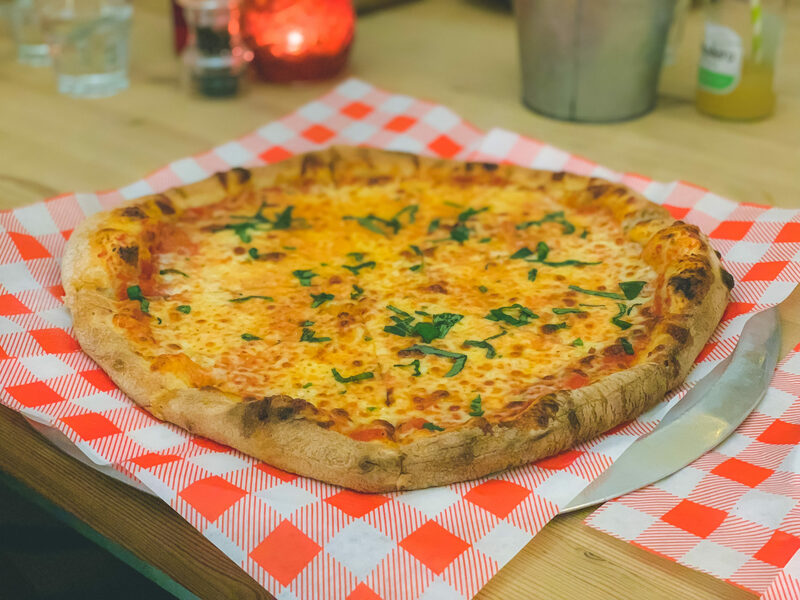 Oscar & Rosie’s is a pizzeria, situated right in the centre of Nottingham, and is a gorgeous independent pizza company using restaurant grade ingredients on pizza. 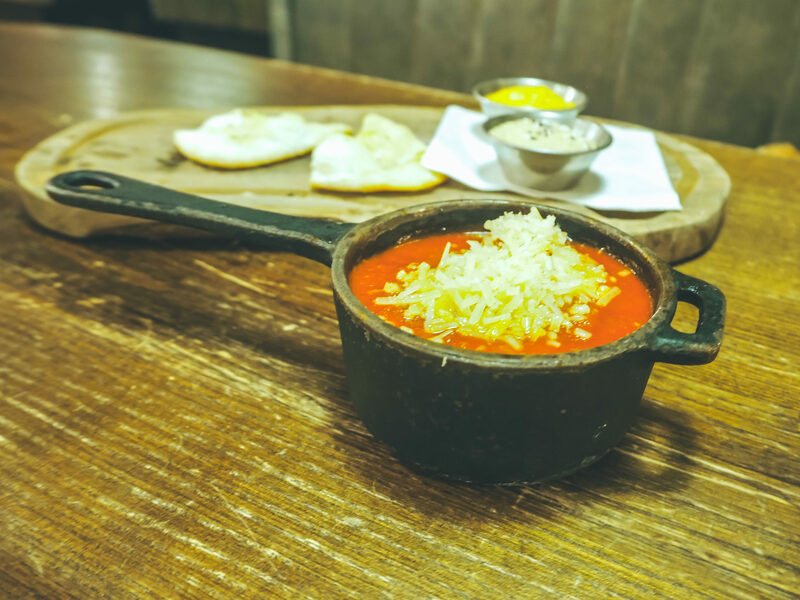 So no pre-made sauces, no poor quality meat, and no pre-grated cheese – just award winning, free range, locally sourced produce, and from the moment we stepped inside and the waft of pizza hit us, I knew that we were in for a treat! The restaurant reminded me of an American diner but with it’s own quirky twist on the decor. 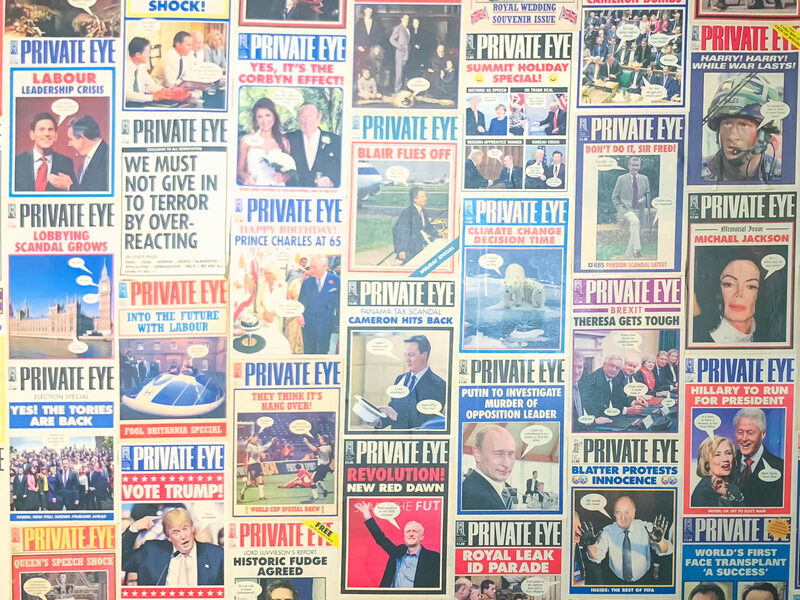 On one wall is a whole collection of Private Eye headlines which looks great! We were seated in the far corner of the restaurant which is always a bonus for us as the children feel a little more contained. 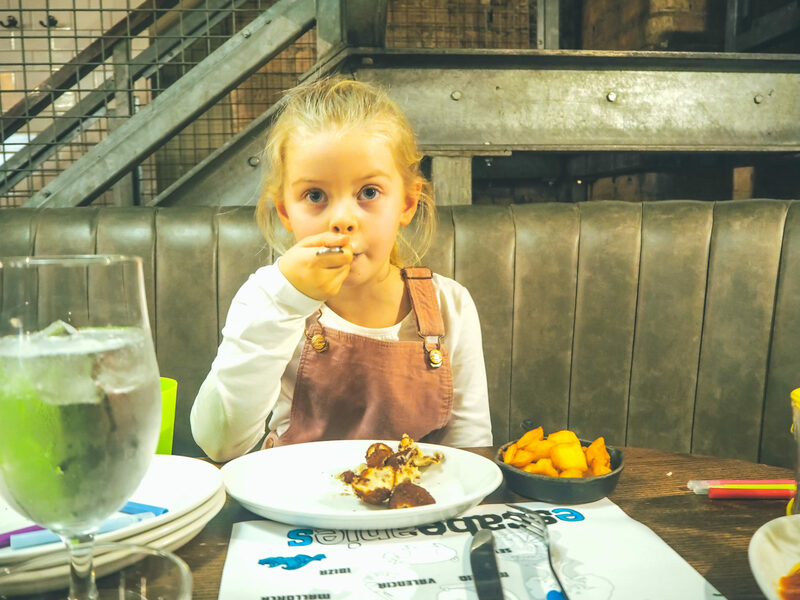 I was surprised that there was no children’s menu but the menu itself is packed with exciting and adventurous flavours and, even better for me, come with the option of a gluten free base. There is also an extensive vegan menu available. 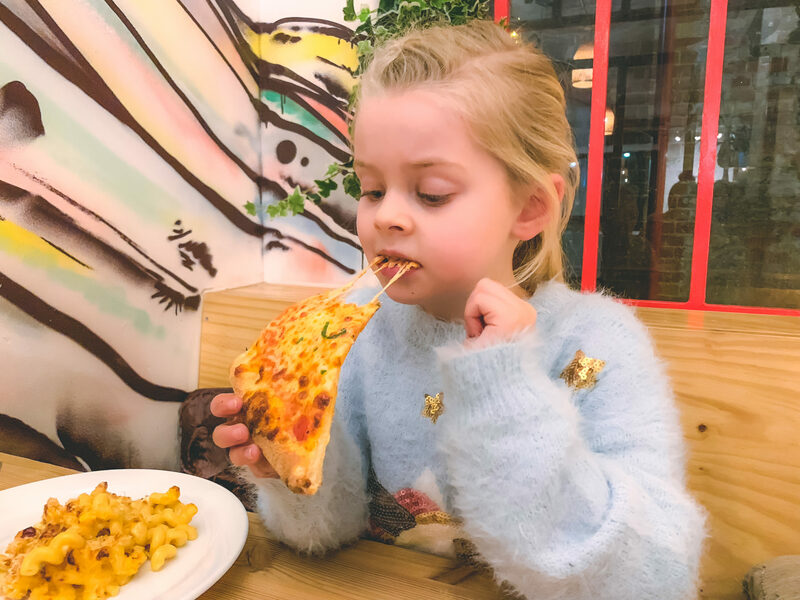 I ordered the Hamster gluten free pizza for myself, with Megan and Harry sharing a classic Margherita, and Eva went for the Macaroni Cheese which was available in six different ways – all of which sounded delicious! 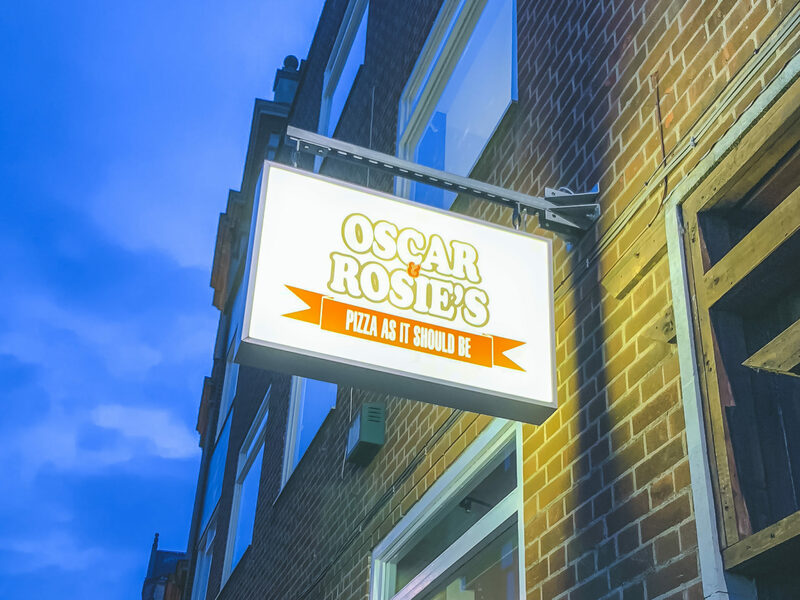 When it comes to pizza, you may wonder how can Oscar & Rosie’s be any different to a regular pizza? I admit, I thought the same, pizza is pizza, right? Wrong. 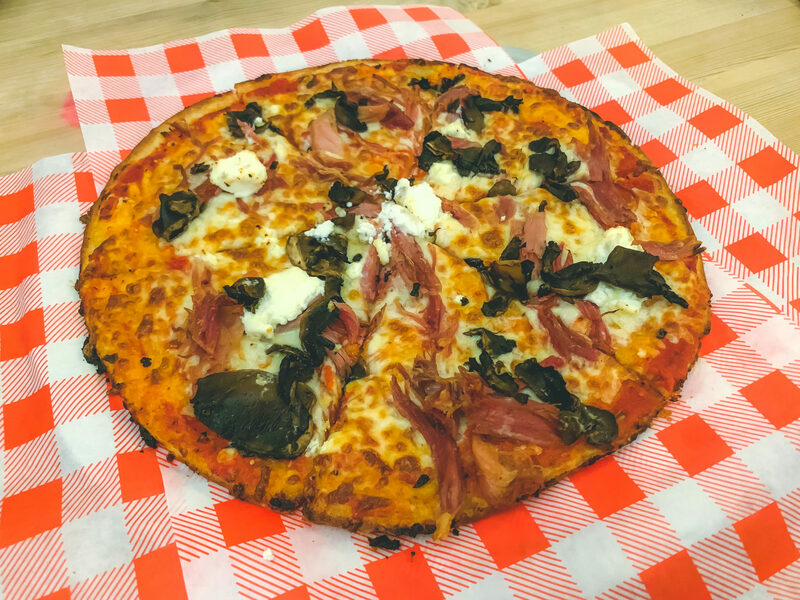 This pizza is on a whole new level of deliciousness, combining the most amazing crust of perfect thickness, fresh toppings of succulent pulled ham hock, flat mushrooms and ricotta cheese, and together I swear, it was the most amazing pizza I, or the kids have ever had. You know those moments when you’re just eating away with a huge smile on your face? That was us, just nodding and “mmm-ing” with every single mouthful, I’m not sure I have ever seen the kids so quiet! Eva’s macaroni cheese looked delicious and was a huge serving (so much so that they gave us half to take home), but she still found room to try a slice of the pizza and the three of them declared it the best pizza they’ve ever tried – and believe me they’ve had a lot of pizza over the years! 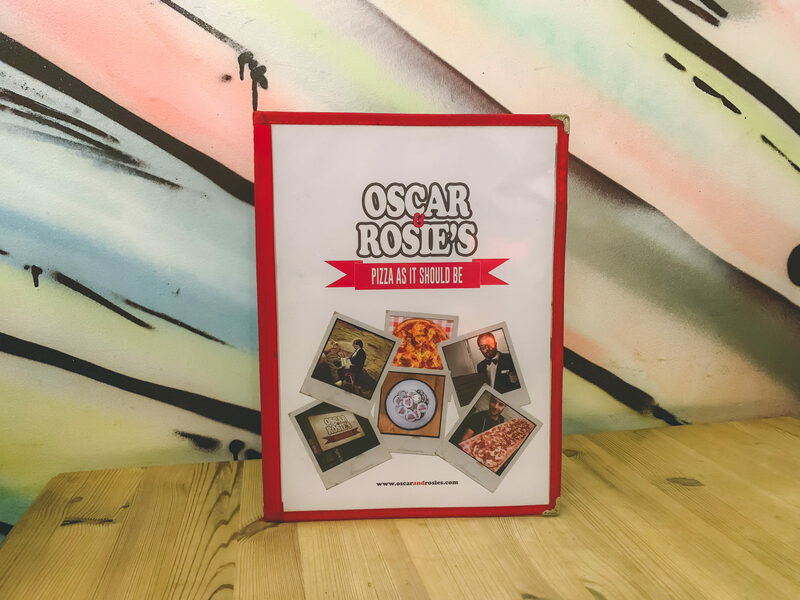 If you’re in Nottingham then eating at Oscar & Rosie’s is a must and I know that next time we are down that way I will be heading straight there, ordering that Hamster pizza, and enjoying every single mouthful all over again! Visit the website here. 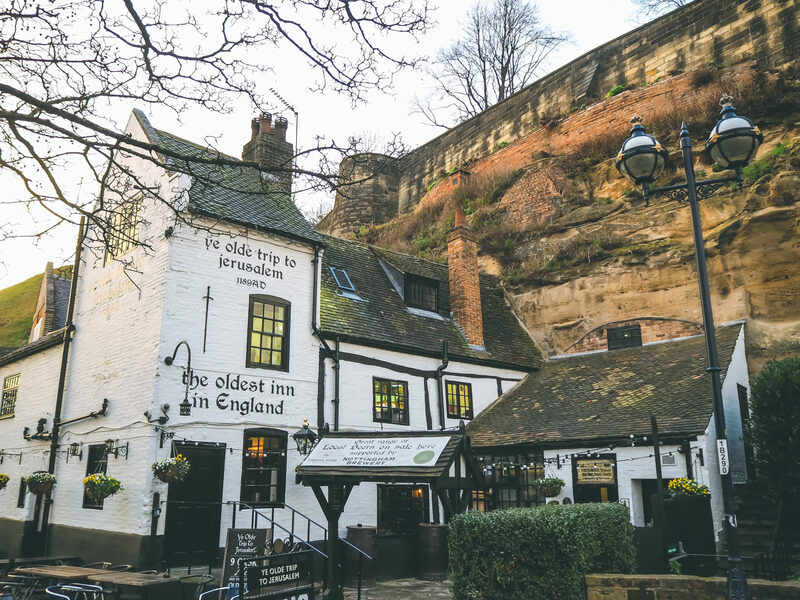 Hailed as England’s oldest inn, Ye Old Trip to Jerusalem is nestled beneath the cliff on which Nottingham’s historic castle stands, and was once a well-known pit stop for crusader knights. It is said that King Richard the Lionheart and his men are more than likely to have gathered at this historic royal dwelling before journeying to Jerusalem in 1189AD, giving the pub its unusual name. 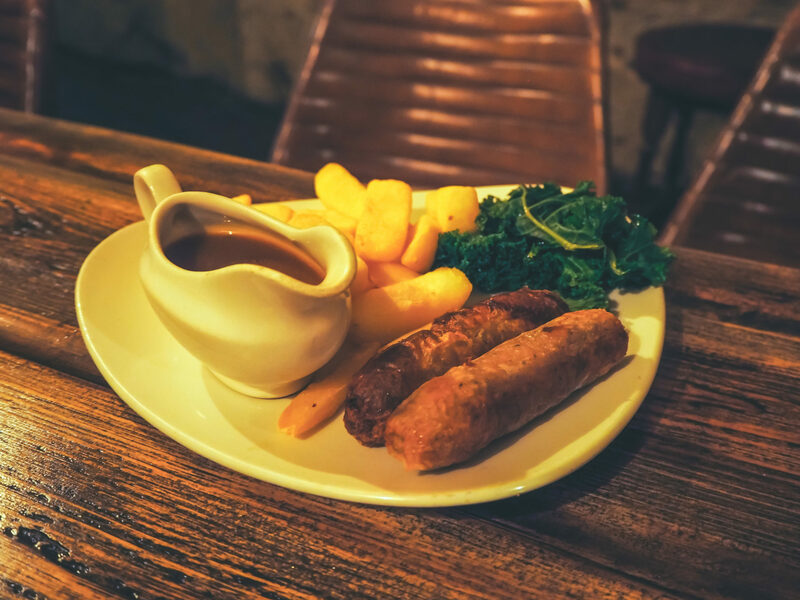 Described as being “between an inn and a museum”,​​​​​ the pub features several bars, cosy nooks and snug lounges filled with curiosities and relics of Nottingham’s history. We were excited to see what the oldest inn in England had to offer and after a long day exploring Sherwood Forest couldn’t wait to tuck in to some home cooked food. We were seated upstairs in what a room which still had it’s cave like appearance with very dim lighting (not good for photographing food!) and low ceilings. The children thought it was very exciting and the novelty of dining within a cave was definitely an experience they will always remember! 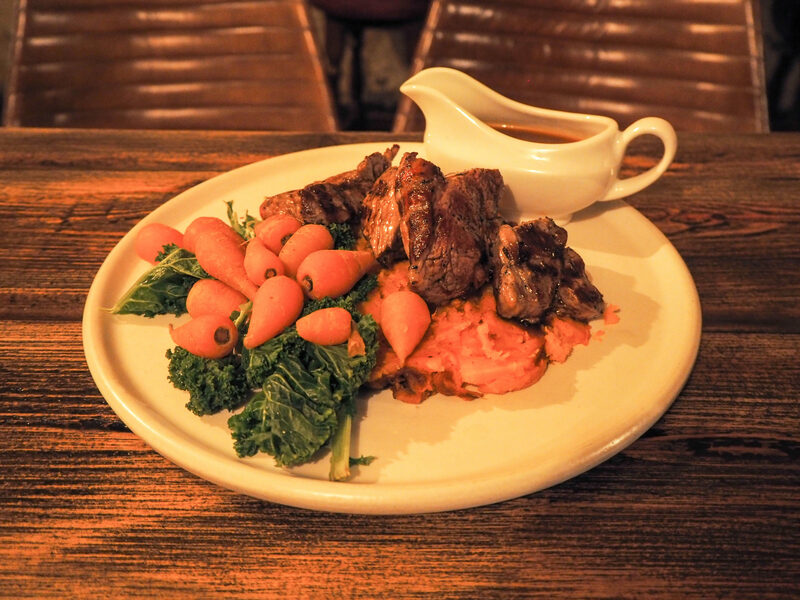 When it came to ordering our food we were disappointed that two of the dishes we requested were no longer being served and the menu had not been updated, and so in the end went for sausage and chips for the children and lamb rump and sweet potato mash for me. When our food came the lamb was nice but the sweet potato mash was uncooked in parts and the carrots a little too al dente for my liking. The children’s meals were a little disappointing as, atlhough the chips were lovely and chunky, the sausages had clearly been frozen and had turned to a brittle powder inside. That said, the children enjoyed the chips and loved the surroundings. Whilst the food wasn’t what we had expected, it could just be that we had visited on the wrong day and I would definitely give them the benefit of the doubt and return to try another meal there in the future. 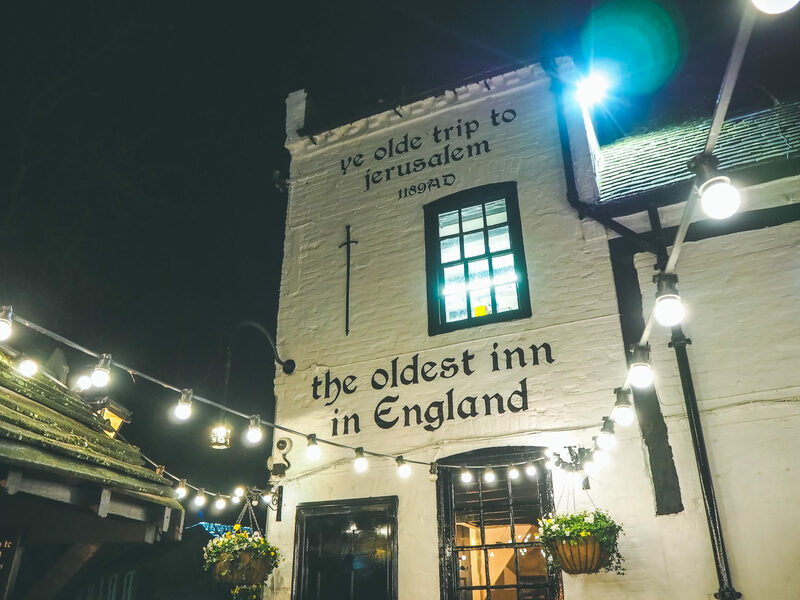 Regardless of the food, for those visiting Nottingham a trip to the Ye Old Trip to Jerusalem is a must if nothing else than to soak up the atmosphere, enjoy stepping back in time, and the chance to say you have visited the oldest inn in England! You can visit the website here. When we were offered the chance to eat at Baresca, a Spanish tapas restaurant on Byard Lane, I’ll be honest, I doubted the children would eat very much there at all. Whilst the girls are a little more adventurous, Harry is the fussiest eater I’ve ever come across and so I definitely had my reservations. That said, I loved the idea of trying something new and tucked away in the city centre, Baresca was instantly welcoming as soon as we stepped inside. The atmosphere in Baresca was perfect for dining with children, visiting on a Friday lunch time the restaurant was full with large tables and I didn’t have to worry about the children being a little too noisy or restless above the sound of others chatting and laughing. With a children’s menu and a lunch time menu for myself, there is a huge selection of meats, fish, and vegan based tapas and the biggest decision was choosing which to try! The thing I love the most about Baresca, and tapas in general, is that the food just comes out as and when it is ready, so there is very little waiting around especially when you’re hungry! 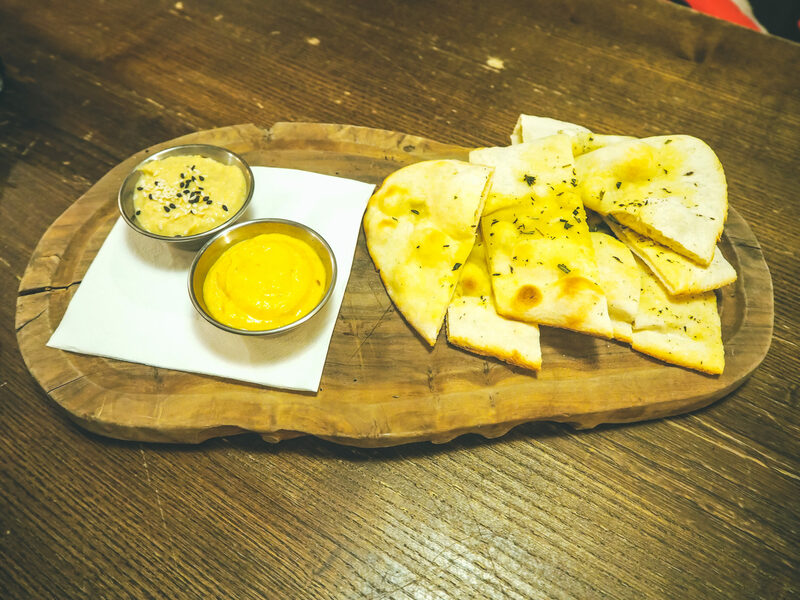 Whilst we waited for the dishes to come out we all tucked into some flatbreads and dips which were lovely and fresh and the children devoured them! Next came the children’s choices – ham croquettes for Eva, Baresca meatballs for Megan, cod pieces for Harry, and patatas for each of them. I went for the Baresca meatballs, which were utterly delicious, served in the tastiest spiced tomato sauce which I could have eaten by the spoonful, and sprinkled with parmesan. 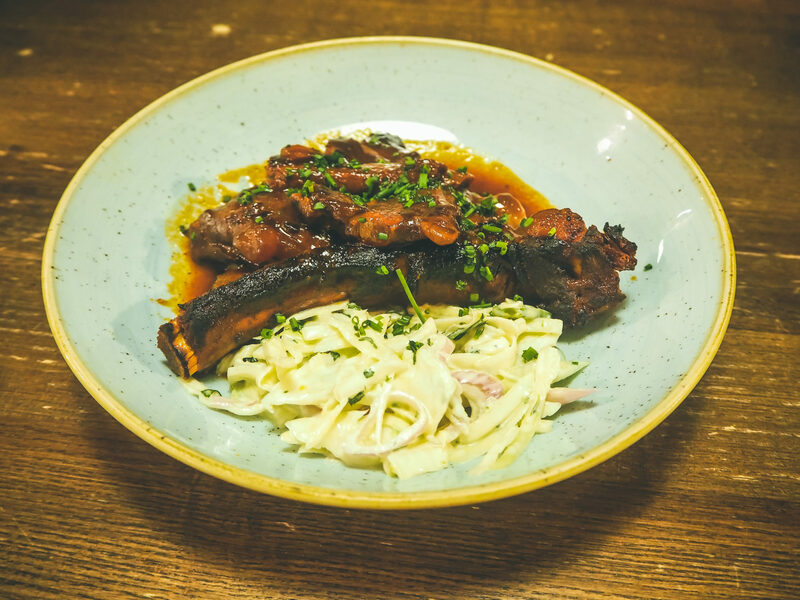 I also went for the Oloroso sticky ribs with a fresh green chilli slaw, both of which were delicious although I did have to share them with the girls who both go crazy for ribs of any kind! 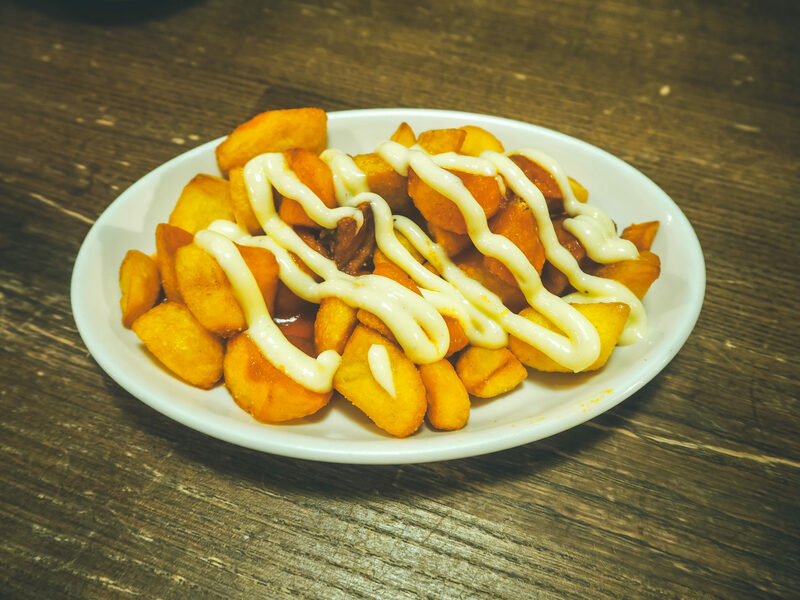 Lastly I ordered a huge serving of patatas bravas which are one of my favourite accompaniments and didn’t disappoint! They were perfectly crisped with a delicious sauce and drizzled with mayo, just how I like them! The food and service at Baresca was faultless and it was great to see the kids tucking into dishes they wouldn’t ordinarily have tried elsewhere. I never imagined taking the kids for tapas and yet it showed me that when push comes to shove, they will try new things and nine time out of ten, they will love them! Baresca has such a laid back atmosphere and that really did rub off on the children. I was able to just sit back, enjoy the food as and when it came to the table, whilst the kids did some colouring and chatted about our week. After five days solo parenting, it was the perfect way to end our holiday and I am really looking forward to enjoying tapas with the children again in the future. You can visit the Baresca website here. i used to live in Nottingham and I would love to take Erin there one day. These restaurants look great for dining with children. What brilliant suggestions! 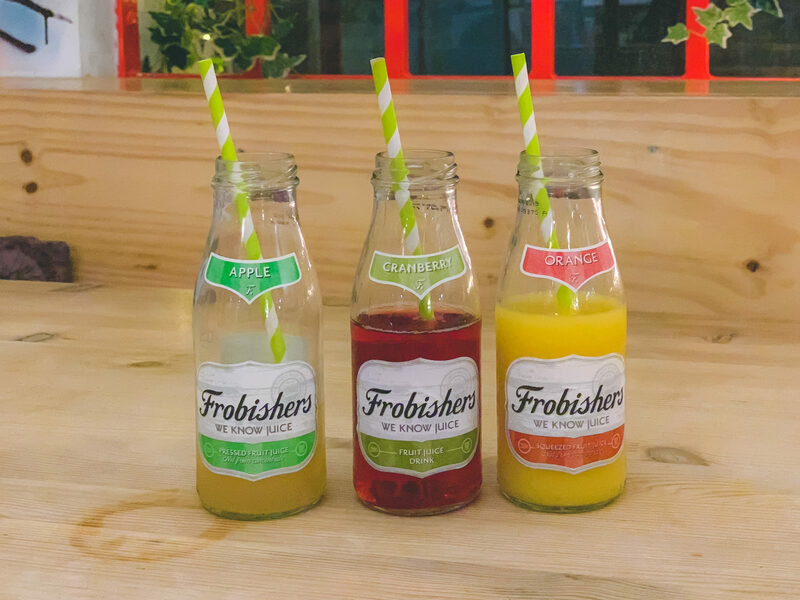 I always look for child friendly options when eating out, so my little one can enjoy too! Oscar and Rosie’s sounds fantastic! The pizza’s do look so much more than your average pizza! 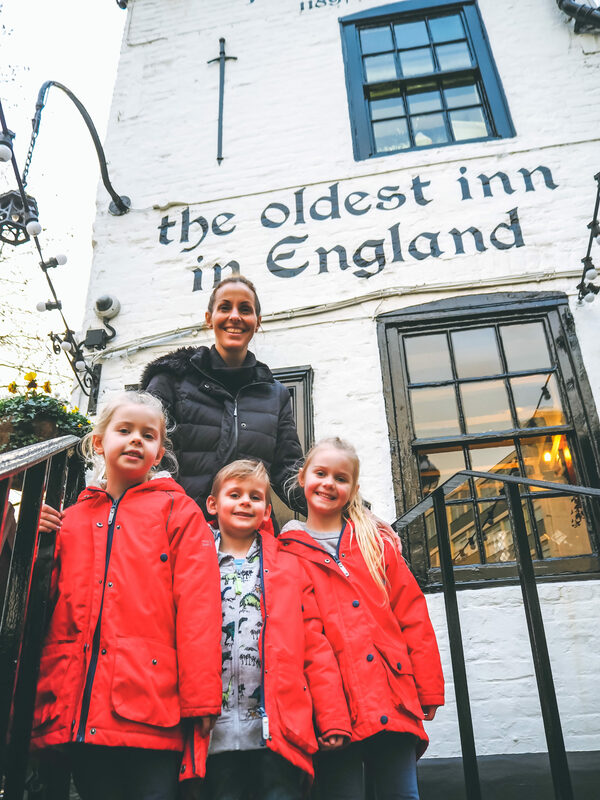 I live in Nottingham and I can say for definite that the ye old Jerusalem inn is a lovely setting and place for the family and children to visit! It’s a shame to read about the sausages though as we have ate there and never had an issue. 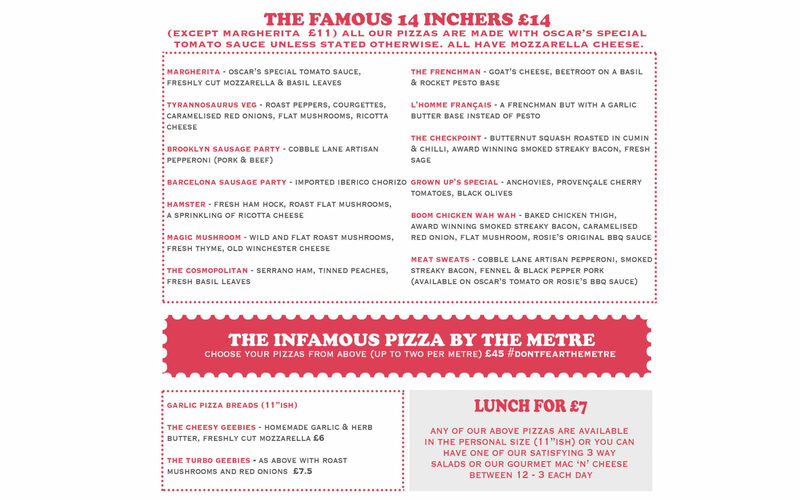 I love the look of those Pizzas, well I love the look of everything!! I’ve never visited Nottingham before so this would be great if we do make a trip there in the future, we’re know where to eat! The restaurants sound very nice. The food looks yummy. It looks like Nottingham has a lot of great places to eat for children. The tapas looks delicious and my girls always love a pizza! I have not been to Nottingham in forever so wouldn’t even know where to begin with finding good restaurants. Thanks for this recommendation. Baresca sounds like my kinda place. I love tapas, so would be in my element there. 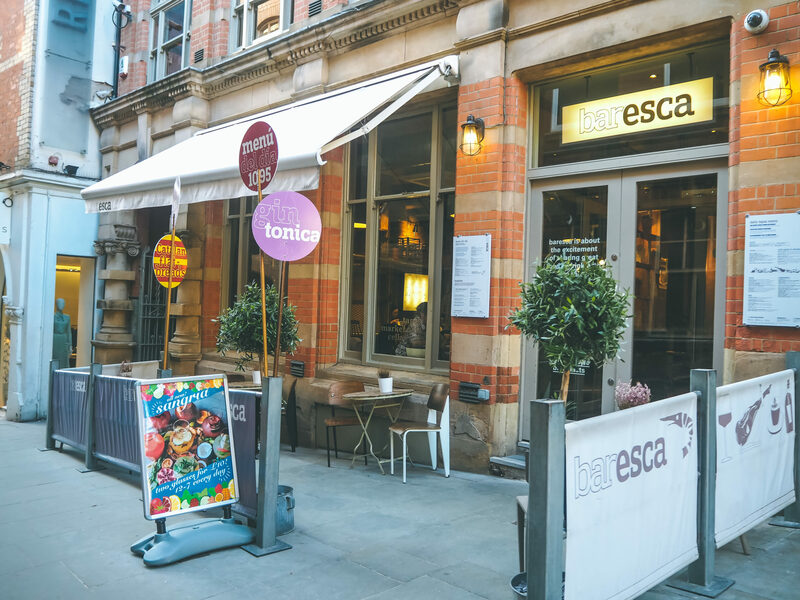 When we visited Barcelona I thoroughly enjoyed tapas so I’d definitely visit Baresca if in Nottingham.